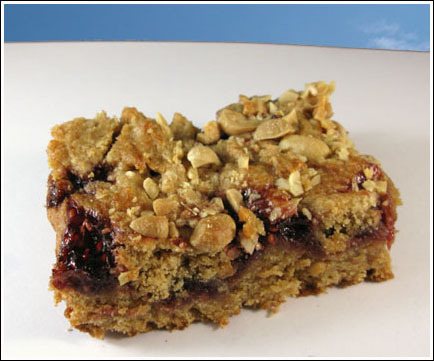 Peanut butter & jelly bar recipe that's made in an 8 inch square pan. Preheat oven to 350 degrees F. and line an 8 inch square metal pan with foil. Spray foil with cooking spray. Cream the butter and sugar on medium speed of an electric mixer until light yellow, about 2 minutes. With the mixer on low, add the vanilla, egg, and peanut butter and mix until all ingredients are combined, scraping sides of bowl. Sift together the flour, baking powder, and salt. Gradually add the flour mixture to the peanut butter mixture and stir gently until incorporated. Spread 2/3 of the dough into the prepared pan. Spread the jam evenly over the dough. Drop small globs of the remaining dough evenly over the jam. Don't worry if all the jam isn't covered; it will spread in the oven. Sprinkle with chopped peanuts and bake for 37 minutes, until golden brown. Cool and cut into 16 squares. *Recipe calls for an extra-large egg rather than the usual large.